This article will detail and give you tips on how and when to use the Split Card strategy when playing online blackjack. For those of you that do not know, the split card strategy can be used when you are initially dealt two cards of equal value. The cards can then be ‘split’ into two hands to play in an attempt to swing the odds in your favour, not the houses. Before you think it is a hidden way of winning, you must remember that if you opt to split your hand, then you must begin betting again, matching your original stake to cover your ‘extra’ hand. If you choose to split your hand, then the two equal cards are split, one to each hand and a second card is dealt to accompany them. Once those two hands have been formed, you now have two hands to play with, but obviously double the stake in play. This strategy is usually used to turn a poor hand into two strong ones. Blackjack strategy says the best hands to split are eights and aces, and hands to avoid splitting are fours, fives, and tens. 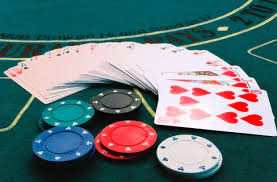 Any other hand should be split if the dealer’s visible card is ranked an eight or higher. An example would be the player being dealt a pair of nines. This would leave you with a total of 18, which is too close to 21 to be considered good as you are more likely to end up bust than with a better hand. If you split the nines into your left and right hands, you now have two hands of nine. In your left hand, you are dealt a ten, and in your right hand you are dealt a four. While you have doubled your stake, you have increased your chances of winning by gaining a total of 19 and not 18, and the total of 13 you have in your right hand can be built upon should you choose not to stick on it. New players, such as those coming from a sports betting background, should not split a hand such as fives, as your total would be 10. With the optimum score being 21, there is no way you can end up bust so it would be ill advised to split into two hands of five, not least because your stake will be doubled. You will not always win with this strategy, but if you stick to it, and remember to watch the dealer’s ‘up’ card in case it is eight or higher, you are likely to see benefits in the long term, but it is no guarantee.